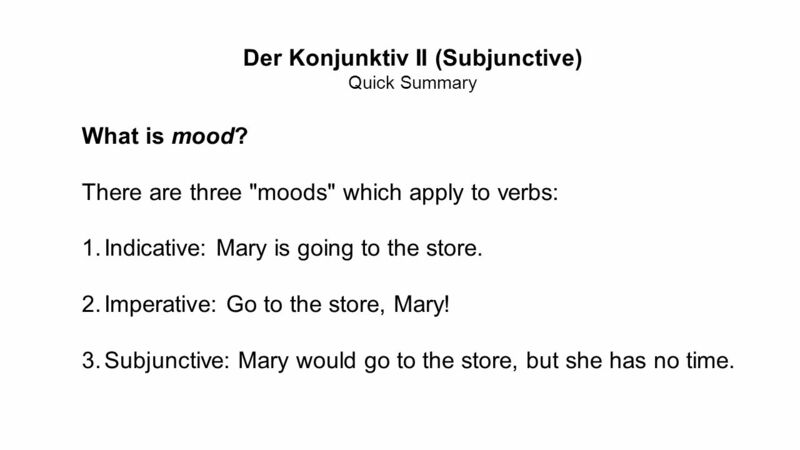 1 Der Konjunktiv II (Subjunctive) Quick Summary What is mood? There are three "moods" which apply to verbs: 1.Indicative: Mary is going to the store. 2.Imperative: Go to the store, Mary! 3.Subjunctive: Mary would go to the store, but she has no time. 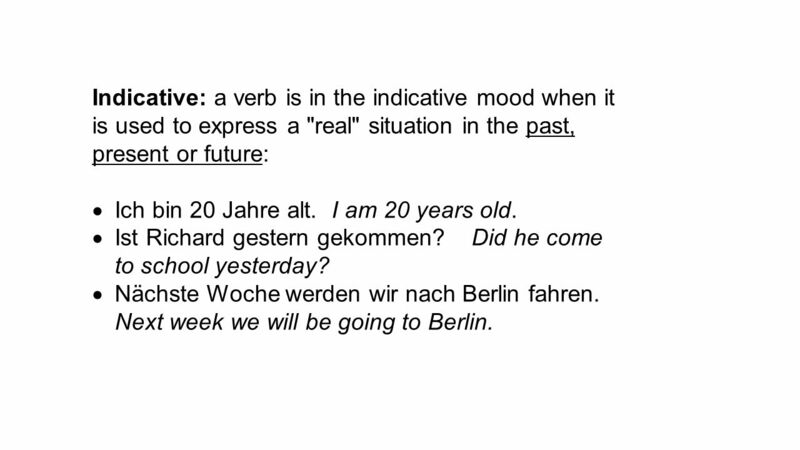 2 Indicative: a verb is in the indicative mood when it is used to express a "real" situation in the past, present or future:  Ich bin 20 Jahre alt. I am 20 years old.  Ist Richard gestern gekommen? Did he come to school yesterday?  Nächste Woche werden wir nach Berlin fahren. Next week we will be going to Berlin. 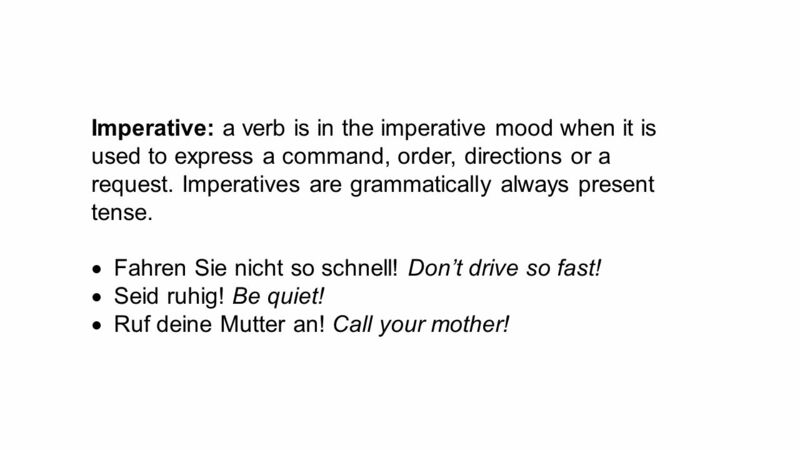 3 Imperative: a verb is in the imperative mood when it is used to express a command, order, directions or a request. Imperatives are grammatically always present tense.  Fahren Sie nicht so schnell! Don’t drive so fast!  Seid ruhig! Be quiet!  Ruf deine Mutter an! Call your mother! 4 Subjunctive: express wishes, probabilities, possible causalities or conditions which are contrary to fact.  Ich wünsche, ich hätte mehr Zeit. I wish I had more time.  Wenn es mehr regnete, hätten wir eine gute Ernte. If it would rain more, then we would have a good harvest.  Wenn er nur nicht so viel trinken würde! If he only would not drink so much! 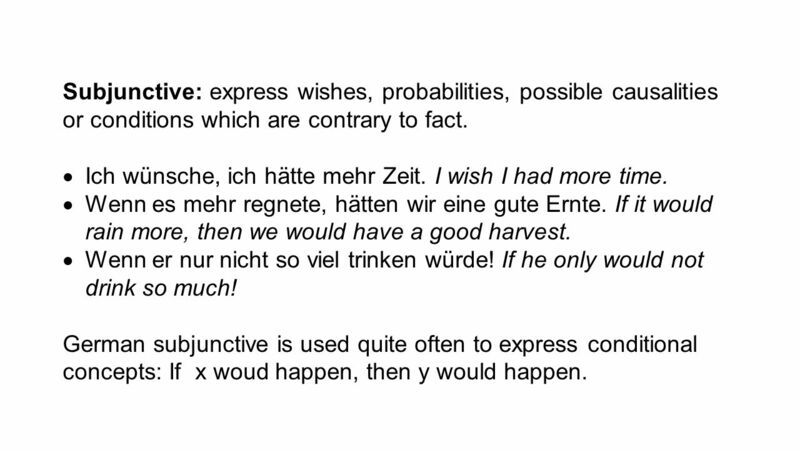 German subjunctive is used quite often to express conditional concepts: If x woud happen, then y would happen. 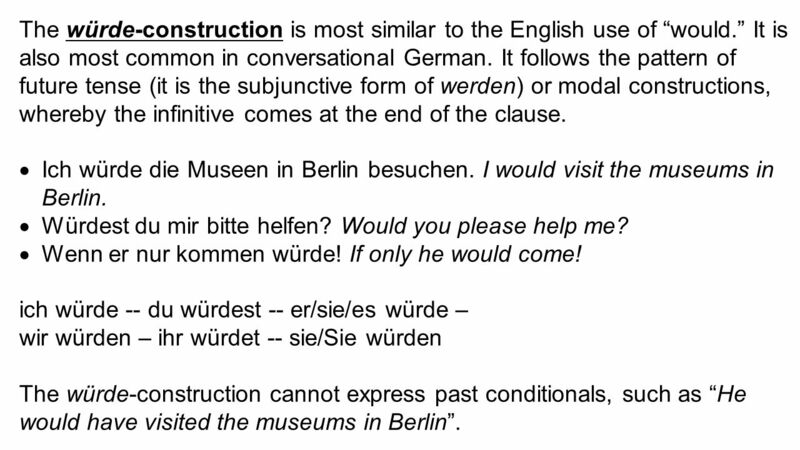 6 The würde-construction is most similar to the English use of “would.” It is also most common in conversational German. It follows the pattern of future tense (it is the subjunctive form of werden) or modal constructions, whereby the infinitive comes at the end of the clause.  Ich würde die Museen in Berlin besuchen. I would visit the museums in Berlin.  Würdest du mir bitte helfen? Would you please help me?  Wenn er nur kommen würde! If only he would come! ich würde -- du würdest -- er/sie/es würde – wir würden – ihr würdet -- sie/Sie würden The würde-construction cannot express past conditionals, such as “He would have visited the museums in Berlin”. 7 Subjunctive formed from simple past tense (preterite). In spoken German these are prevalent for sein, haben, modal verbs and for a few other verbs such as kommen and wissen. 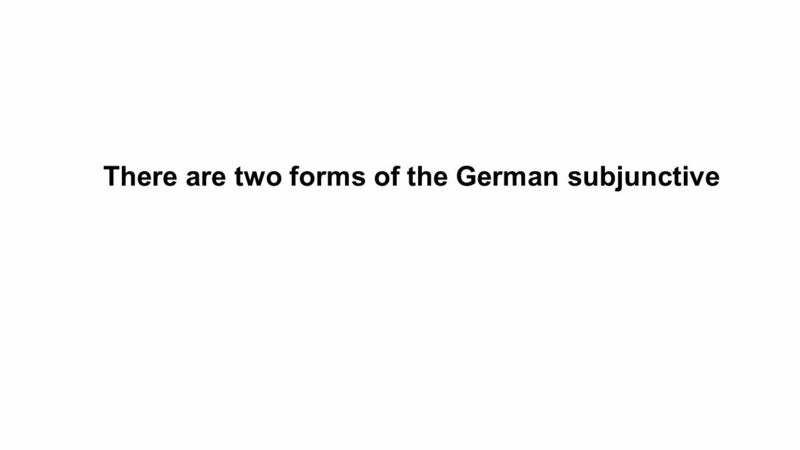 Otherwise, this form is used primarily in formal writing. 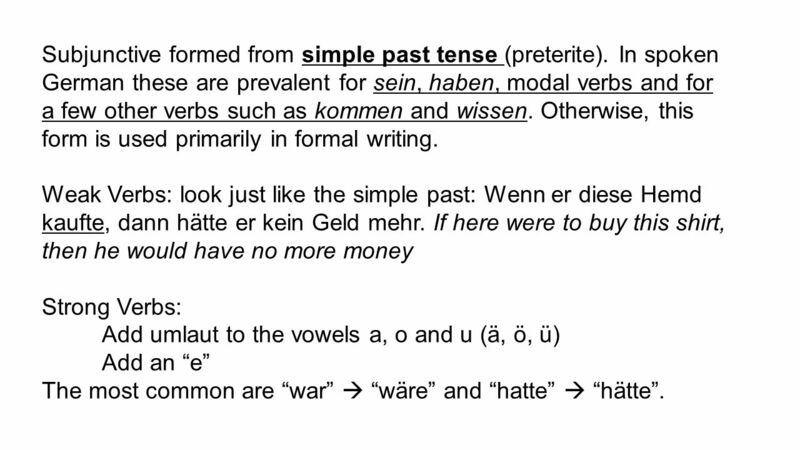 Weak Verbs: look just like the simple past: Wenn er diese Hemd kaufte, dann hätte er kein Geld mehr. If here were to buy this shirt, then he would have no more money Strong Verbs: Add umlaut to the vowels a, o and u (ä, ö, ü) Add an “e” The most common are “war”  “wäre” and “hatte”  “hätte”. 10 Conditional Wenn ich Zeit hätte, würde ich lesen. If I had time, I would read. Wenn er spräche, würde ich nicht zuhören. If he spoke (were to speak), I wouldn’t listen. Wenn du dich beeilen würdest, könnten wir anfangen.If you would hurry, we could start. Ich würde kommen, wenn du mich einladen würdest.I would come if you invited (were to invite) me. 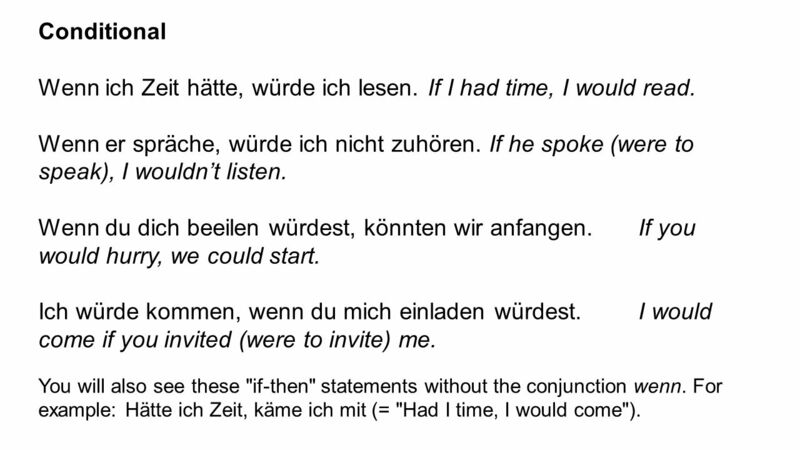 You will also see these "if-then" statements without the conjunction wenn. For example: Hätte ich Zeit, käme ich mit (= "Had I time, I would come"). 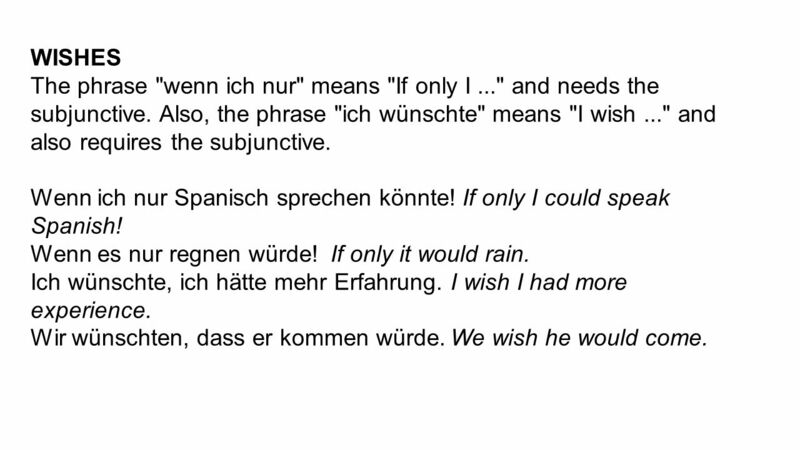 11 WISHES The phrase "wenn ich nur" means "If only I..." and needs the subjunctive. 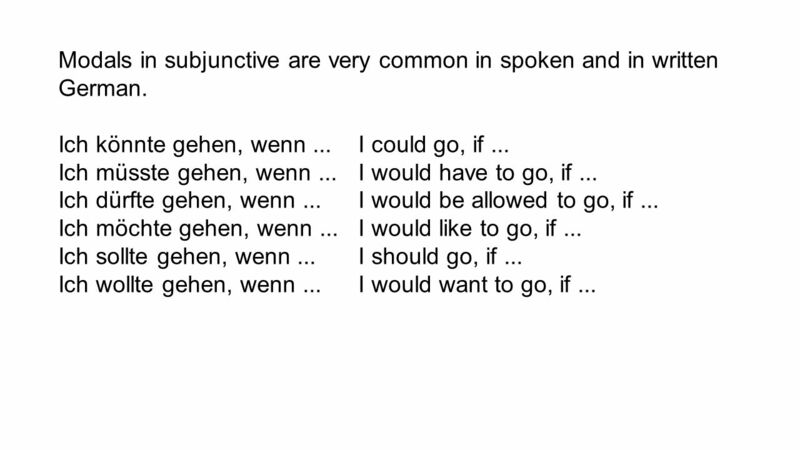 Also, the phrase "ich wünschte" means "I wish..." and also requires the subjunctive. Wenn ich nur Spanisch sprechen könnte! If only I could speak Spanish! Wenn es nur regnen würde!If only it would rain. Ich wünschte, ich hätte mehr Erfahrung.I wish I had more experience. Wir wünschten, dass er kommen würde.We wish he would come. 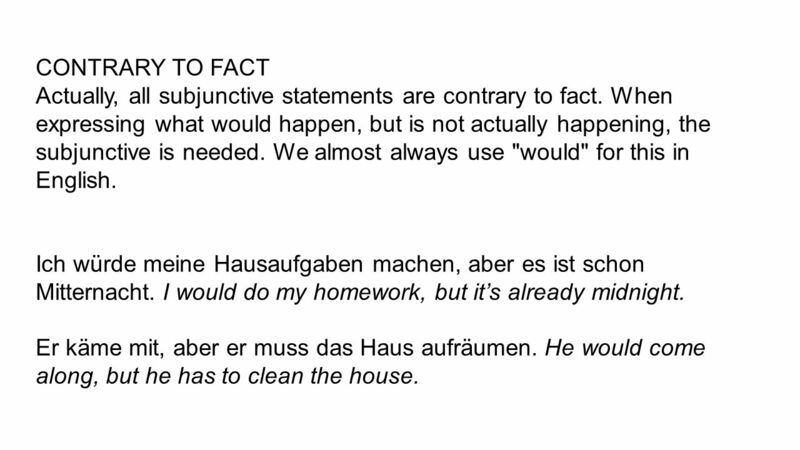 12 CONTRARY TO FACT Actually, all subjunctive statements are contrary to fact. When expressing what would happen, but is not actually happening, the subjunctive is needed. We almost always use "would" for this in English. Ich würde meine Hausaufgaben machen, aber es ist schon Mitternacht. I would do my homework, but it’s already midnight. Er käme mit, aber er muss das Haus aufräumen. He would come along, but he has to clean the house. 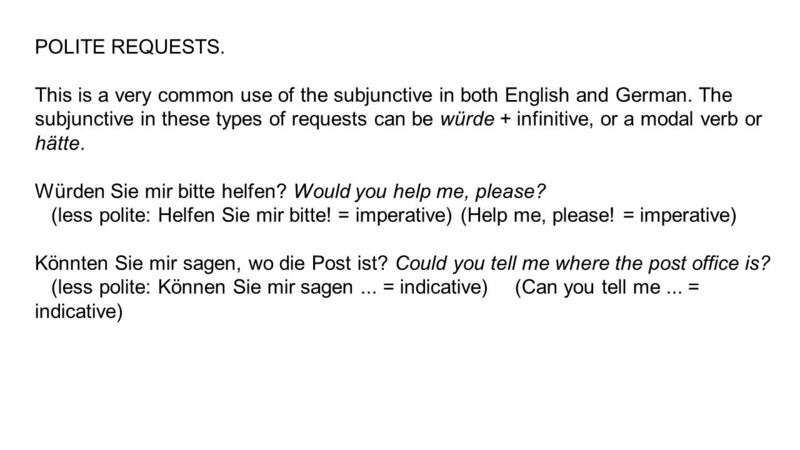 Herunterladen ppt "Der Konjunktiv II (Subjunctive) Quick Summary What is mood? There are three "moods" which apply to verbs: 1.Indicative: Mary is going to the store. 2.Imperative:"
Die Zukunft The future I will.